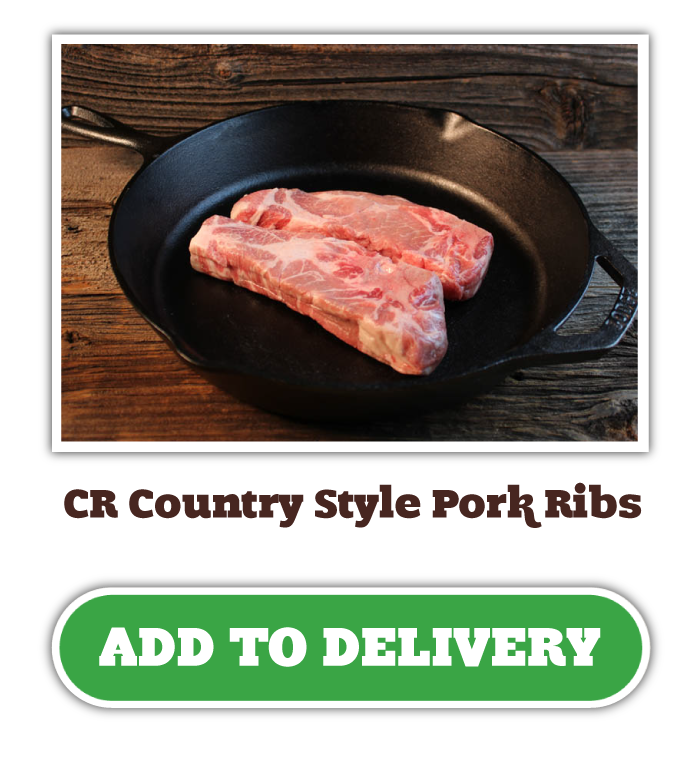 Recipe - Country Style Pork Ribs :: Crescent Ridge Dairy - Serving Greater Boston with home delivery of milk, meat, and more! Glazed and fork-tender, this apple-rich preparation of our own farm-raised pork ribs is the perfect gateway to cool weather and warm fall flavors. Our own apple cider is the key, both as a braising liquid and as the star ingredient to a sweet and tangy BBQ sauce for slathering (recipe on reverse side). Serve the ribs with your favorite hearty sides, from braised greens, to cornbread, to macaroni and cheese. 2. Combine the salt, pepper and spices in a small bowl. 3. Pat the ribs dry with paper towels and sprinkle them all over with the spice mixture. 4. Arrange the seasoned ribs in a baking dish. Pour the apple cider into the dish and give it a quick tilt to even out the liquid. 6. Carefully transfer the ribs to a broiler-safe baking sheet lined with aluminum foil. Tent with foil for 20 minutes to one hour. 7. Degrease the braising liquid by either pouring it into a fat separator, or skimming the fat with a spoon. Reserve the liquid for braising or drizzling over your side dishes (it's excellent for braising greens and spooning over mashed potatoes). 9. Untent the ribs and paint with Apple Cider BBQ Sauce. Broil for 2-3 minutes, flip, then paint the other side. Continue broiling, painting and flipping in 2-3 minute intervals until the ribs are lacquered and charred to your liking. Serve with extra BBQ sauce. 1. Heat the oil over medium-low heat in a Dutch oven or large heavy-bottomed pot. Sauté the onions until translucent and pale gold, about 12-15 minutes. 2. Add the garlic to the pot and sauté for about 2 minutes to take the raw edge off. It’s okay if the ingredients brown slightly at the edges. 3. Add the tomatoes, apples, salt and crushed red pepper to the pot. Raise the heat to medium and sauté until the tomatoes have broken down and reduced, about 8-10 minutes. 4. Stir in the apple cider, apple cider vinegar, molasses, chili powder, onion powder, black pepper, cinnamon and allspice. Bring the mixture to a boil over high heat, then reduce to a rapid simmer. Cook, uncovered (stirring occasionally), until the mixture has thickened, darkened and reduced by half, about 1 to 1 1/4 hours. 5. Remove the pot from the heat and stir in the yellow mustard. Allow the sauce to cool, uncovered, for 45 minutes. It should now look like a thick chutney. 6. Blend the sauce to a uniform consistency using a countertop or immersion blender. For a smoother texture, pass the sauce through a food mill or fine mesh sieve. 7. Refrigerate leftover sauce in an airtight container for up to 10 days (or more, depending on the temperature of your refrigerator). Subscribe for the latest farm news and deals!